Reading Room Cliffs Notes is the essential guide to what's going on in the Reading Room for the upcoming week. "Flashback" captures a highlight from last week, while "Foreshadowing" gives a full list of the upcoming week's events. 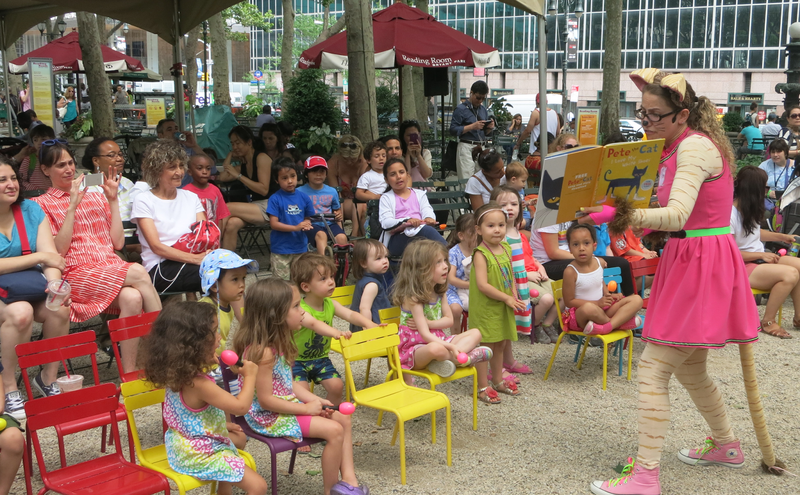 Make a visit to the Bryant Park Reading Room presented by HSBC a plot point in your week! Cali Co Cat reads some of her favorite stories. Forty kids joined Cali Co Cat last Tuesday to kick off the annual StoryTime in Bryant Park. Every Tuesday at 10am, until August 11, Cali Co will be here for stories, music and crafts. Lively and entertaining commentary on the films of Paul Thomas Anderson. With resident film expert Scott Adlerberg and film critic and author Stephen Whitty. Lead singer of Slipknot and Stone Sour sounds off about the things that tick him off most – not the least of which is the sorry state of lots of music today. The first person to say "You're Making Me Hate You" to the Reading Room Coordinator at the event will win a free copy of the book.